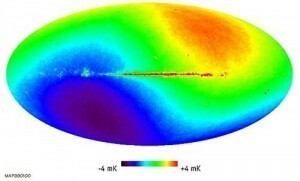 Yesterday I wrote about the cosmic microwave background (CMB). The image I included showed fluctuations in temperature, which proves that the universe had a non-uniform structure even at its earliest age. Of course the image was processed to show those small fluctuations in temperature. Below is a less processed image, and there are two things that stand out pretty clearly. The first is the central line across the middle, which is the image of our own Milky Way galaxy. The second is that the upper right portion of the image is very red, while the lower left is bluish purple. Last time I noted that red regions were warmer, while blue regions were cooler. Does this mean that half of the universe is bit warmer than the other? Actually no, because there is something else going on here. The image is based on observations of microwave light coming from a particular direction. By looking at the spectrum of that light we can tell its temperature, but that assumes nothing strange is going on. In this case something strange is going on. There are actually two ways that the spectrum of microwave light can be affected. One is by changing the temperature of the source, but another is by moving relative to the source. The latter is commonly known as the Doppler effect. Just as the visible light from stars and galaxies can be shifted toward the blue when they are moving toward us and red when they are moving away from us, the CMB can be redshifted and blueshifted. What this unprocessed (less processed) image shows is that we are moving away from the lower left region of this map, and toward the upper right region. When you do the math we find our galaxy is moving about 360 km/s relative to the cosmic background. 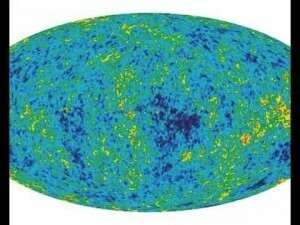 The cosmic background exists for the whole universe, so in a way you could say it is the reference frame of the universe. Our 360 km/s motion is relative to that reference frame, which is surprisingly fast. I am almost sure its the other way around. We move towards the lower left region and thats why its blueshifted….and away from upper right which causes the redshift. No, it’s right, it’s just that the image is confusing. The red area is blue shifted, therefore has a higher apparent temperature. The blue area is redshifted, therefore has a lower apparent temperature. Because it’s a map of temperature things look backwards. “Its a map of temperature”…..that feels like a rock falling on my big toe 🙂 You are 101% correct. I appreciate your reply, thanks. I’ve always been lead to think that the universe had no absolute frame of reference and that linear velocity is only relative. So does this turn that idea on its head? It doesn’t really. 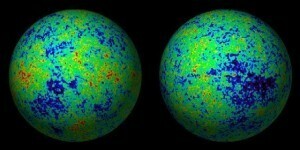 The cosmic microwave background is also a “relative” frame. It’s no different from the fact that the Earth’s surface can be treated as “at rest” for our every day lives.